By Arthur Juliani, University of Oregon. When it comes to neural network design, the trend in the past few years has pointed in one direction: deeper. Whereas the state of the art only a few years ago consisted of networks which were roughly twelve layers deep, it is now not surprising to come across networks which are hundreds of layers deep. This move hasn’t just consisted of greater depth for depths sake. For many applications, the most prominent of which being object classification, the deeper the neural network, the better the performance. That is, provided they can be properly trained! In this post I would like to walk through the logic behind three recent deep learning architectures: ResNet, HighwayNet, and DenseNet. Each make it more possible to successfully trainable deep networks by overcoming the limitations of traditional network design. I will also be providing Tensorflow code to easily implement each of these networks. If you’d just like the code, you can find that here. Otherwise, read on! 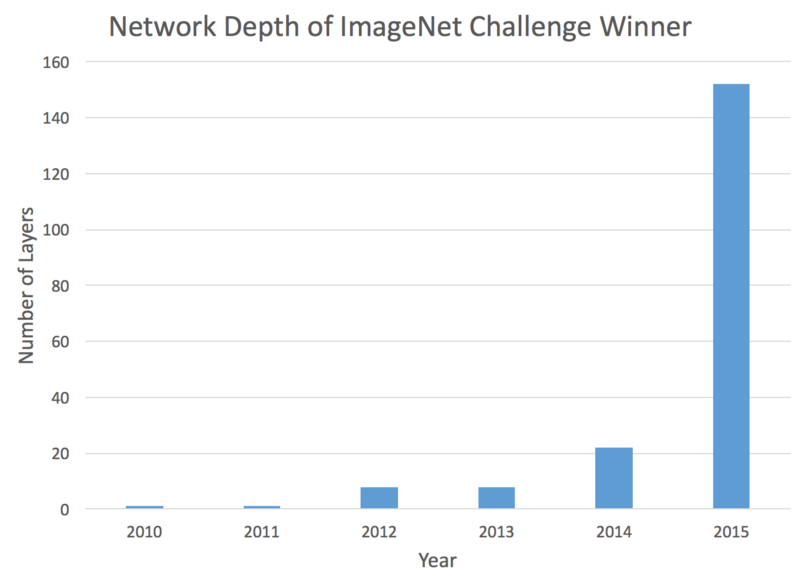 The trend toward deeper networks is clear. The first intuition when designing a deep network may be to simply stack many of the typical building blocks such as convolutional or fully-connected layers together. This works to a point, but performance quickly diminishes the deeper a traditional network becomes. The issue arises from the way in which neural networks are trained through backpropogation. When a network is being trained, a gradient signal must be propagated backwards through the network from the top layer all the way down to the bottom most layer in order to ensure that the network updates itself appropriately. With a traditional network this gradient becomes slightly diminished as it passes through each layer of the network. For a network with just a few layers, this isn’t an issue. For a network with more than a couple dozen layers however, the signal essentially disappears by the time it reaches the beginning of the network again. So the problem is to design a network in which the gradient can more easily reach all the layers of a network which might be dozens, or even hundreds of layers deep. This is the goal behind the following state of the art architectures: ResNets, HighwayNets, and DenseNets. The “+ x” at the end is the shortcut. It allows the gradient to pass backwards directly. By stacking these layers, the gradient could theoretically “skip” over all the intermediate layers and reach the bottom without being diminished. ResNet Unit architecture. BN stands for Batch Normalization. Weight can refer to fully-connected or Convolutional layer. Finally I want to introduce the Dense Network, or DenseNet. You might say that is architecture takes the insights of the skip connection to the extreme. The idea here is that if connecting a skip connection from the previous layer improves performance, why not connect every layer to every other layer? That way there is always a direct route for the information backwards through the network. This architecture makes intuitive sense in both the feedforward and feed backward settings. In the feed-forward setting, a task may benefit from being able to get low-level feature activations in addition to high level feature activations. In classifying objects for example, a lower layer of the network may determine edges in an image, whereas a higher layer would determine larger-scale features such as presence of faces. There may be cases where being able to use information about edges can help in determining the correct object in a complex scene. In the backwards case, having all the layers connected allows us to quickly send gradients to their respective places in the network easily. All of these network can be trained to classify images using the CIFAR10 dataset, and can perform well with dozens of layers where a traditional neural network fails. With little parameter tuning I was able to get them to perform above 90% accuracy on a test set after only an hour or so. The full code for training each of these models, and comparing them to a traditional networks is available here. I hope this walkthrough has been a helpful introduction to the world of really deep neural networks!